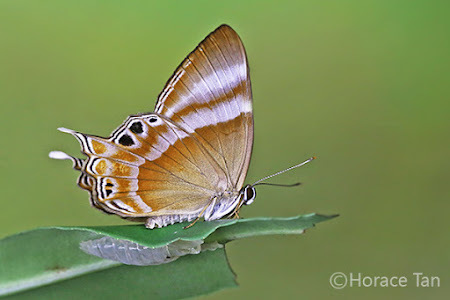 The family Riodinidae was previously classified as sub-family Riodininae of the Lycaenidae family (ref : Butterflies of the Malay Peninsula 4th Edition), but raised to family status subsequently in more recent publications. 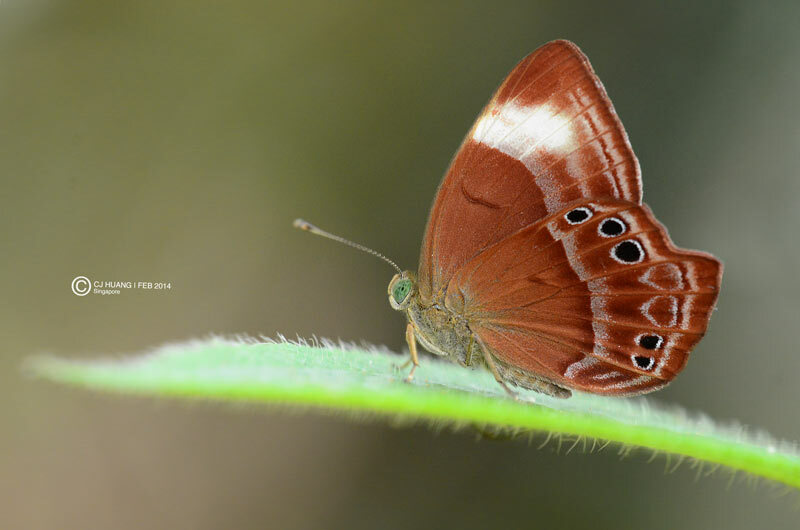 Many species in the family feature metallic markings on their wings, giving rise to their collective common English name of "Metalmarks". 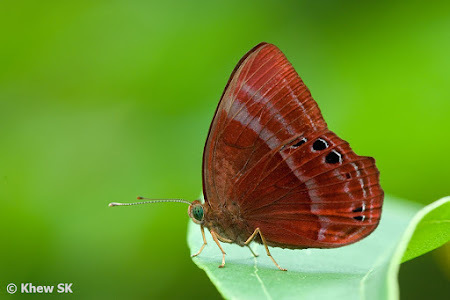 In the Southeast Asian region, the Riodinidae is characterised by small, reddish-brown butterflies that prefer deep forest shade habitats. They have a unique, short, hopping flight and alight on the upper surfaces of leaves with half-opened wings. 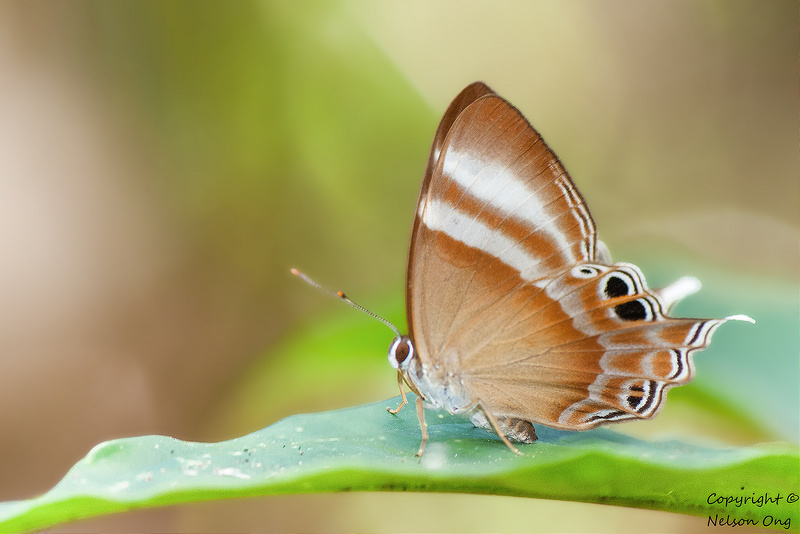 When active, they will twist and turn on the leaf with jerky walking movements, often to the frustration of the butterfly photographer who is trying to get an ideal angle to shoot them. Many species of the Riodinidae have yellow-green eyes. A special characteristic of the family is that the forelegs of the males are under-developed, appearing more like hair tufts. The females, on the other hand, have all six legs fully developed. 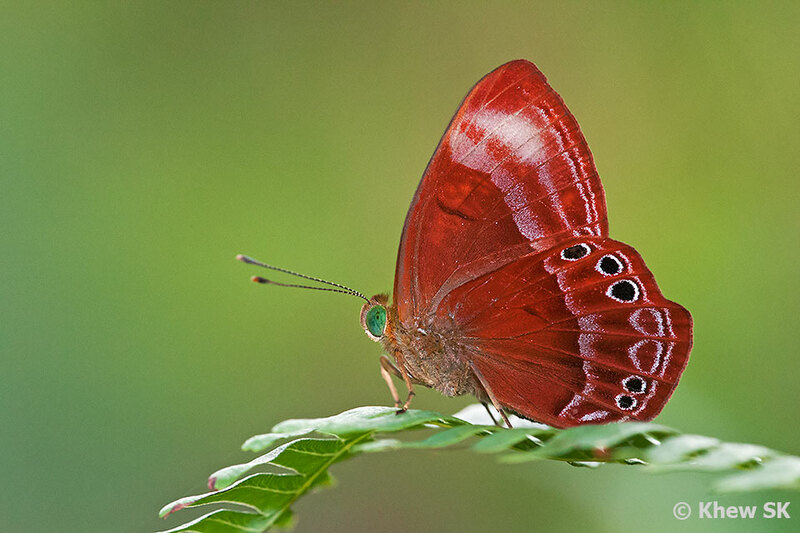 In Singapore, the Riodinidae is represented by five species in three genera. 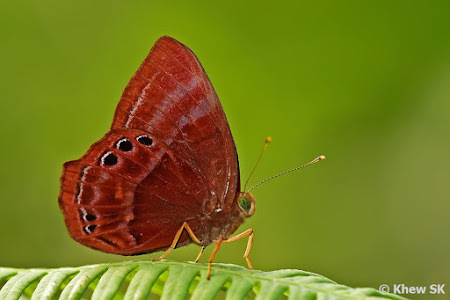 Of the five species, three belong to the genus Abisara. The species in this genus are collectively named Judy. 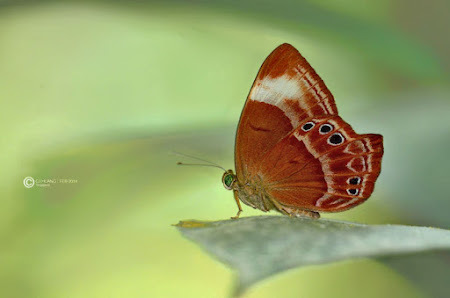 It is interesting that the common names of the group of butterflies in the Riodinidae originate from the traditional beach puppet or marionette show of "Punch and Judy". The species of another Riodinidae genus, the Dodona, have all their species named after Punch. However, this genus is not extant in Singapore. 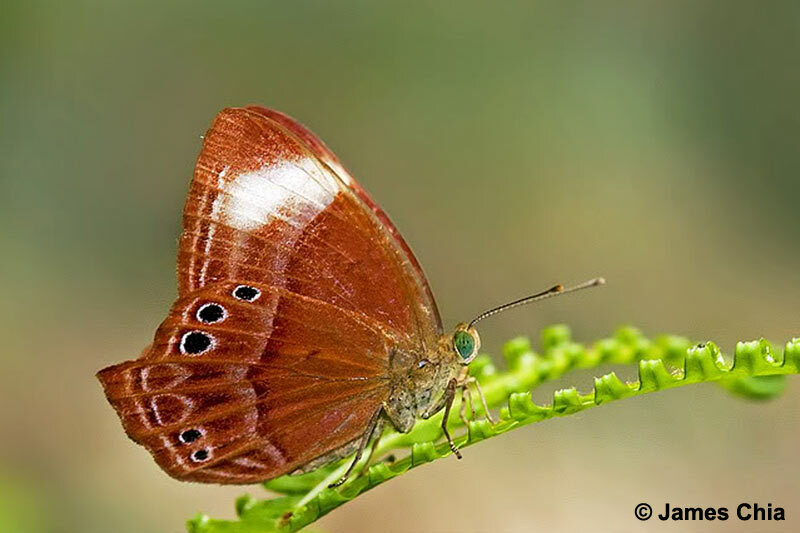 This article introduces the three Judy species found in Singapore. The extant species of the Abisara spp. in Singapore are the Malayan Plum Judy (Abisara saturata kausambioides), the Spotted Judy (Abisara geza niya) and the Malay Tailed Judy (Abisara savitri savitri). 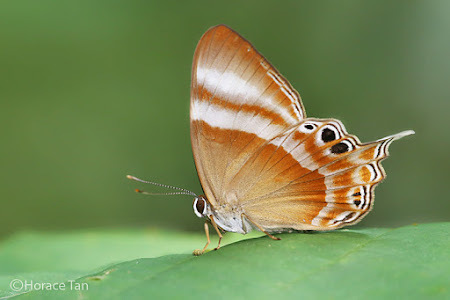 It was earlier thought that another Malaysian species, the Straight Judy (Abisara kausambi kausambi) also exists in Singapore, but further research showed that this species is not found here. The most common of the three Abisara species found in Singapore, the Malayan Plum Judy is found at urban parks and gardens as well as in the forested areas of the nature reserves. 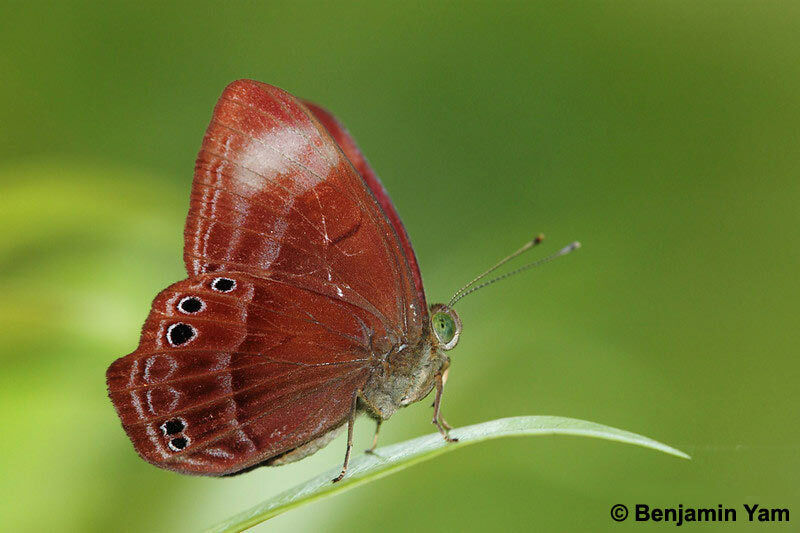 It can also be found on the offshore island of Pulau Ubin. Males are more often seen, but both sexes display the typical Riodinidae behaviour of hopping from leaf to leaf and turning around with their wings half-opened. The upperside of the male is a deep crimson brown without any markings. When viewed in a sidelight, the upperside may show a purple-blue colouration. The paler underside features a pair of diffused pale purplish post-discal bands. The outer band on the hindwing has a series of large black, white-edged submarginal spots. The paler female has a diffused white sub-apical patch on the forewing, whilst the hindwing "tail" is prominently angled at vein 4 and appears to flare out wider than in the male. The Malayan Plum Judy has been successfully bred on two alternative host plants - Ardisia elliptica (Myrsinaceae), Embelia ribes (Myrsinaceae). The second of the Judy species found in Singapore is the Spotted Judy. 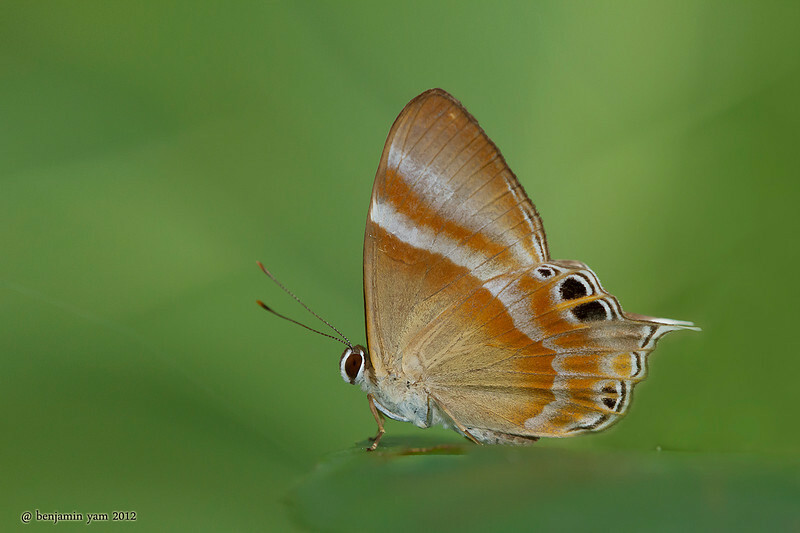 This species is superficially similar to the Malayan Plum Judy in appearance. 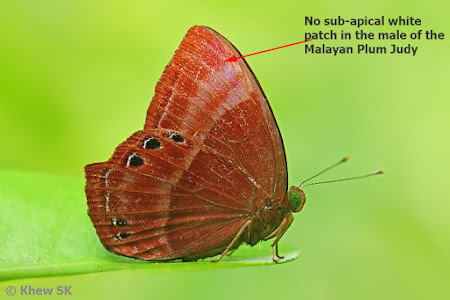 Also a deep crimson brown in colour, the male of the Spotted Judy differs from the Malayan Plum Judy in the whiter diffused subapical patch on the outer post-discal band. Female Spotted Judy. Note less extensive sub-apical white patch on the forewing and the dislocated post-discal band at vein 4 of the hindwing. In the female, the diffused sub-apical patch is more restricted than in the Malayan Plum Judy. 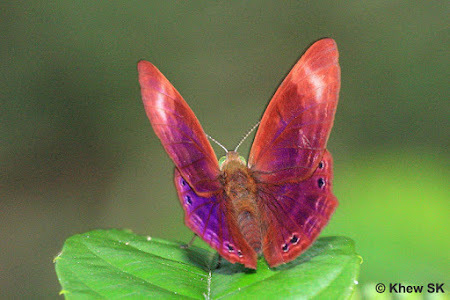 The hindwing "tail" is also prominently angled at vein 4 and displays the similar flare that is wider than in the male. 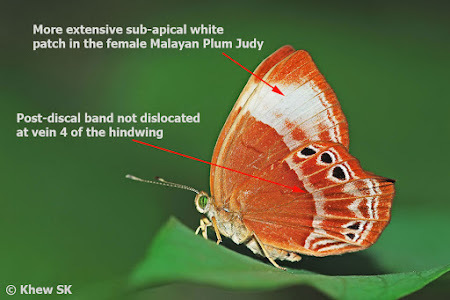 Both sexes can be separated from the Malayan Plum Judy in their diagnostic characteristic hindwing post-discal band that is dislocated at vein 4. Upperside of the male Spotted Judy. 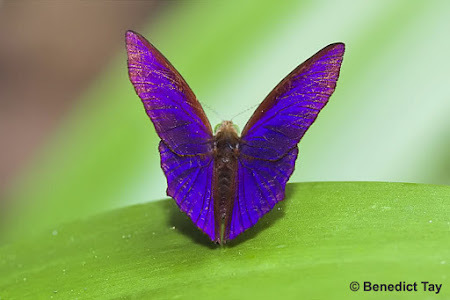 The structural scales diffract light at certain angles where the wing colour shows a purple-blue. 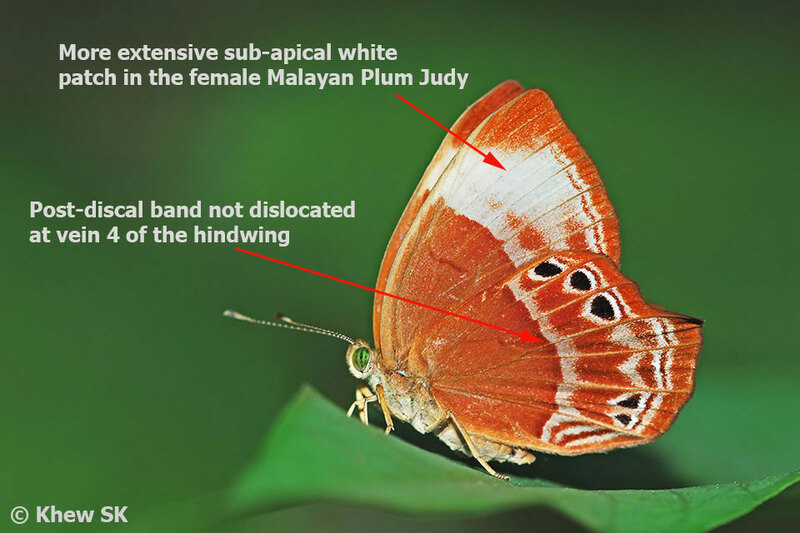 The Spotted Judy is moderately rare, but can be found in generally the same habitats as the Malayan Plum Judy. Males are sometimes seen 'dog-fighting' in the late hours of the day. The species can be found in urban parks and gardens as well as in the forested nature reserves, preferring heavily shaded environments. It has been successfully bred on Embelia ribes (Myrsinaceae) and Embelia canescens (Myrsinaceae). The third and rarest Judy found in Singapore is the Malay Tailed Judy. 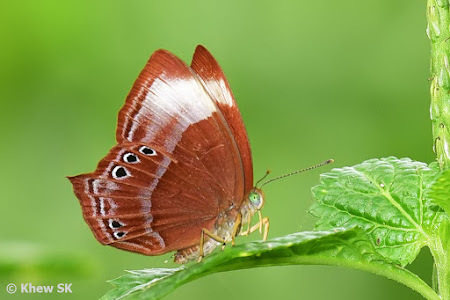 It is found mainly in the heavily shaded forested areas of the nature reserves. This forest-dependent species is generally larger than its previous two related species. It also differs from the other two in that, instead of the crimson brown wings, the Malay Tailed Judy is a pale beige with a light tinge of violet. It cannot be mistaken for any other species in Singapore. 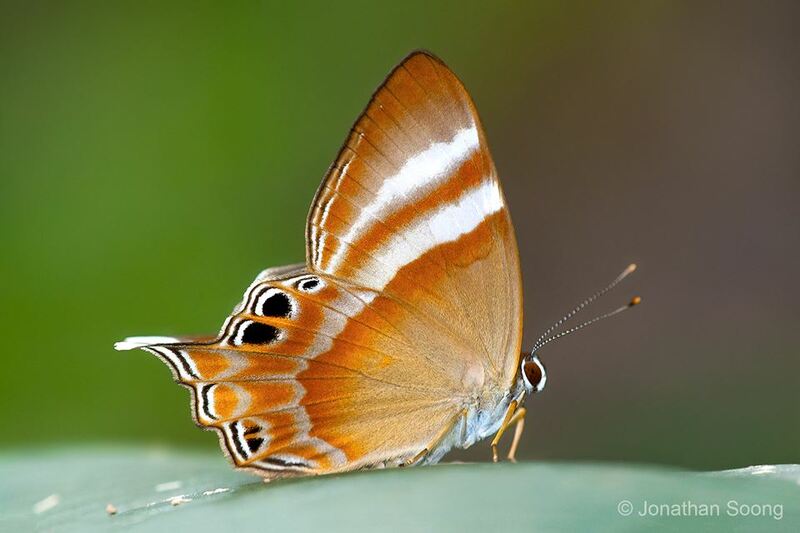 The Malay Tailed Judy features two diffused white transverse sub-apical stripes on the forewing. It has a distinctly longer white tipped tail at vein 4 of the hindwing. It shares the behavioural characteristic of hopping on the upper surfaces of leaves with half-opened wings. 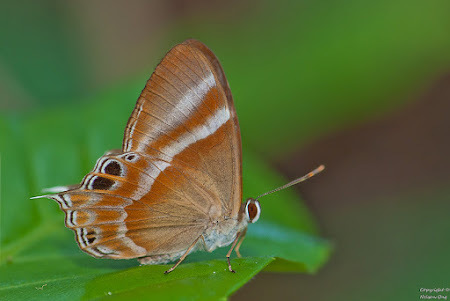 The Malay Tailed Judy has been successfully bred on the same host plants as the Spotted Judy - Embelia ribes (Myrsinaceae) and Embelia canescens (Myrsinaceae). The species can be occasionally observed feeding on overripe fruits on the forest floor. Text by Khew SK : Photos by James Chia, Huang CJ, Khew SK, Nelson Ong, Jonathan Soong, Horace Tan and Benjamin Yam.